BabyNaturopathics.com - Organic Mother's Massage Oil By Neal's Yard Remedies - Baby Naturopathics Inc.
You can earn 39 bnReward Points on this product! An idea gift for new or expectant mothers. 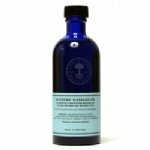 This luxurious blend of organic neroli, almond, and mandarin oils is packaged in a distinctive cobalt blue glass bottle. Apply the oil to areas prone to developing stretchmarks or use it to simply moisturize the skin. 95% organic ingredients. This oil does not leave a greasy residue on your skin. Due to the purity and quality of the ingredients, this oil�is quickly absorbed into the skin. Try it yourself - rub the�Mother's Massage Oil into your skin and then press a tissue onto your skin. You'll be amazed by the results. Formulated by Neal's Yard Remedies of London. Apply it directly onto the skin or pour a few drops into your bathwater. Soya oil*, almond oil*, wheatgerm oil, neroli oil*, mandarin oil*.